Hydrangea is a gorgeous medium scale pattern design in blue with a hint of yellow on a white ground. Made in the USA of 100% Cotton 7 ounce duck cloth. 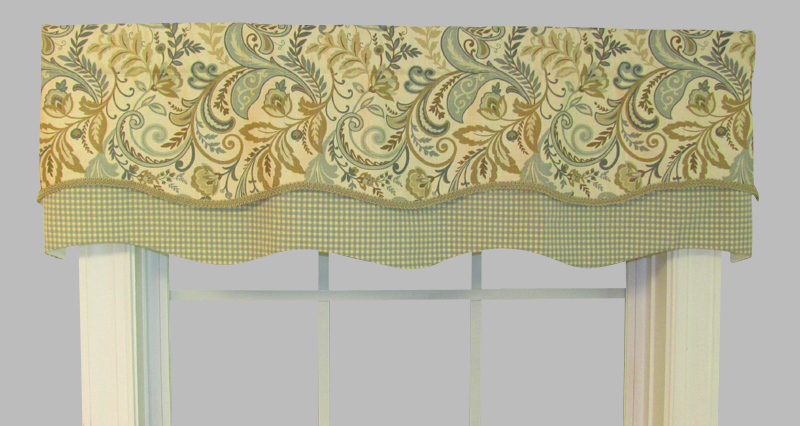 The Scallop Valance features self cording along its beautifully scalloped bottom edge. Rod pocket is 3 inches and header is 2 inches. Use a 2-1/2" flat continental rod or up to 1-1/2 inch diameter decorative rod. Bright and cheery Curious Birds visit on a leafy branch of green tones and brown. Each little bird features orange, yellow, blue tones and white and is set on a ground in your choice of Soliel or Sky. The Scalloped Valances measures 100 inches wide by 15 inches long, not including the 2 inch header. The bottom scalloped edge is self corded. It is fully lined in white high quality lining material. Allow two to two and one half the width of your rod for proper fullness. Use a 2.5 inch continental rod for hanging. Made in America and machine washable. Made of Polyester and COtton blend. Made in the USA featuring classic cascading, the Karaman Cambridge Valance is versatile enough to suit any contemporary or traditional décor scheme. Karaman features a striking tonal zig zag woven fabric design, which blends well with existing decor. The Valance has a 3-inch rod pocket, 2-inch header and a scalloped bottom edge embellished with self-cording for the ultimate in sensible style. It measures 75 inches wide by 18 inches long from top stitch and fully lined. For proper fullness allow two times the width of your rod. Photo illustrates a one and one half times ratio of fullness (75" width on a 40" wide window). Featuring classic self corded scallops along bottom edge, the Corded Scalloped Valance is versatile enough to suit any contemporary or traditional décor scheme. Use multiples to accommodate wider windows. It features a 3-inch rod pocket, 2-inch header and a scalloped bottom edge embellished with self-cording for the ultimate in sensible style. This Corded Scalloped Valance measures 100 inches wide and 15 inches long. Made in the USA. The Scalloped Valance is versatile enough to suit any contemporary or traditional décor scheme. Available in two convenient widths (50-inch, and 100-inch). Additional sizes can be special ordered, call us for a quote. The Scalloped Valance features a 3-inch rod pocket, 2-inch header and beautiful scalloped bottom edge embellished with self-cording for the ultimate in sensible style. All widths are 16 inches long from top stitch. Fully lined with high quality Luster Sateen lining, the best quality in the industry. You will love the meticulous workmanship and fabric quality we put into making the best to be found anywhere, and made in the USA. Featuring classic self corded scallops along bottom edge and available in many beautiful custom fabrics, the Corded Scalloped Valance is versatile enough to suit any contemporary or traditional décor scheme. Wider sizes are available. Use multiples to accommodate wider windows, or pair with the Corded Swag. It features a 3-inch rod pocket, 2-inch header and a scalloped bottom edge embellished with self-cording for the ultimate in sensible style. All widths are 15 inches long from top stitch of rod pocket. 100"W x 15"L Cream - only one in stock. 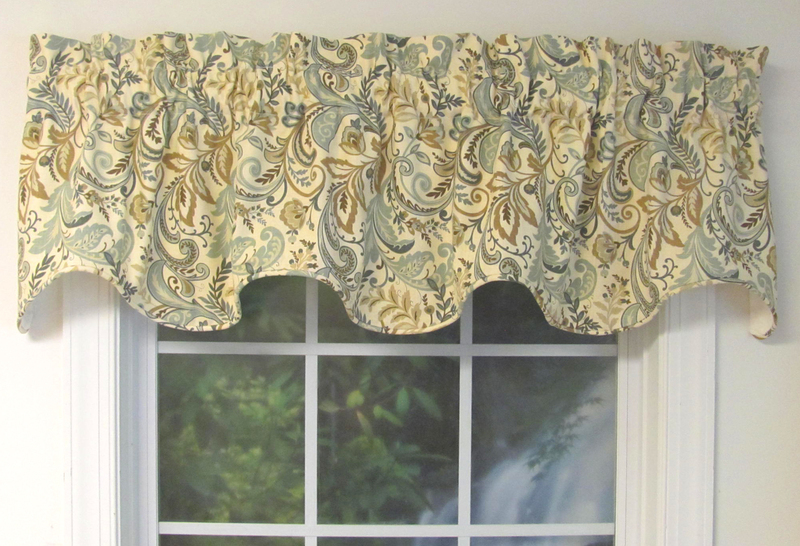 The Luxuriance double scalloped valance has two fabric designs. A rich floral fabric pattern with your choice of a poppy red or cream background rests atop a second scalloped valance layer of Lucas stripes in coordinating colors. It's a beautiful look in American-made window toppers available in a 50-inch width from The Curtain Shop. The length is 15 inches. Satiny gold cording decorates the scalloped border. This is a fully lined valance. 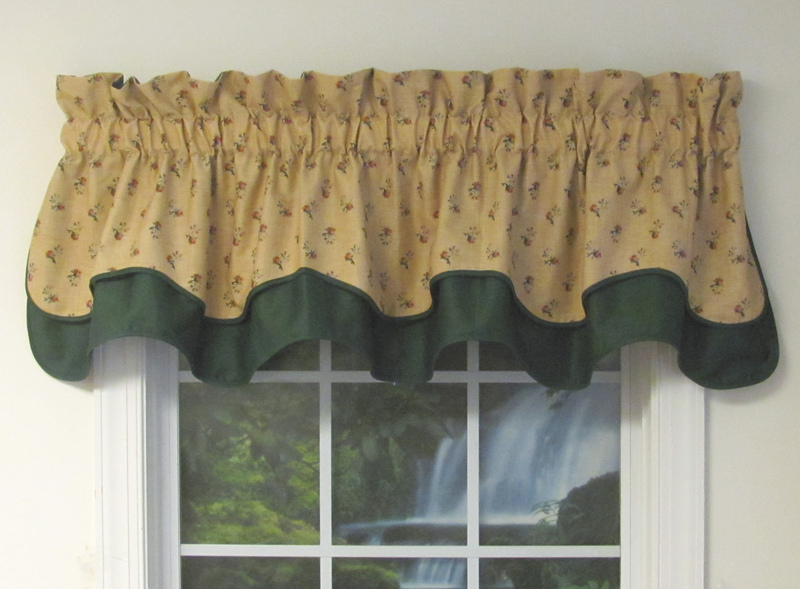 The Double Scallop Valance features a 3" rod pocket, and no header. Use a 2 1/2" Continental rod for hanging. Fits a standard single window up to approximately 46" wide. For wider windows, look for the Double Scallop Valance in the "Valance" section of our "Almost Custom - Faith Edward" department. 3" rod pocket, no header, fully lined. 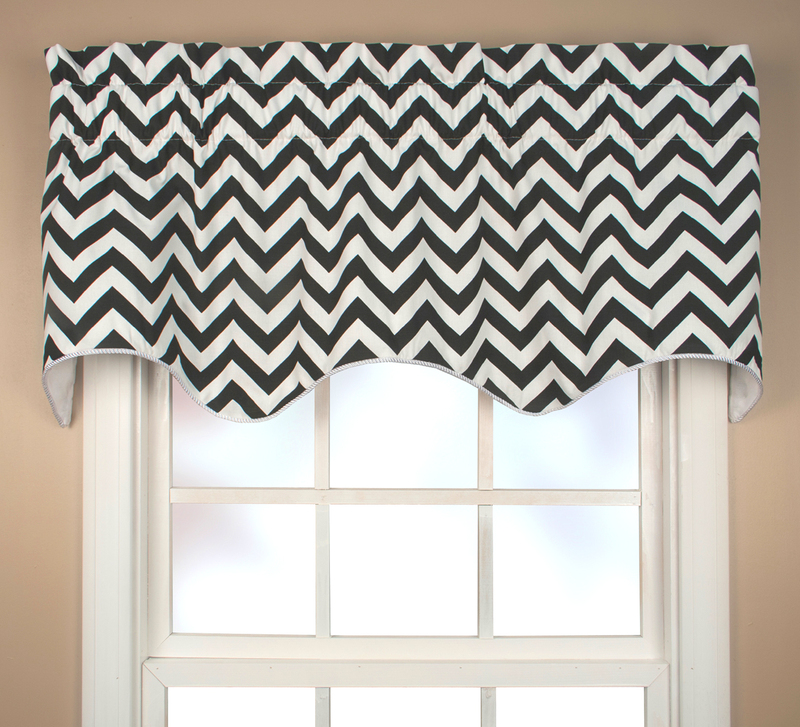 Add contemporary flair to any room with these American-made Reston chevron window valances from The Curtain Shop. Choose spa, sterling, pink, lime turquoise or black horizontal zigzag stripes on white. The scallop-shaped bottom edge is trimmed in white cording. The width is 50 inches, and the length is 17 inches on this fully lined valance in 100 percent cotton. The 3-inch rod pocket will accommodate a 2 1/2-inch diameter continental curtain rod. The 2-inch header creates subtle ruffles at the top. This Regency Duchess filler valance made in the U.S. by Ellis Curtains is designed to fit Duchess valances to accommodate wide window sizes. This versatile valance filler also can be used alone. The Imperial Dress pattern is a medium-scale Jacobean floral on floral print available in blue or antique from The Curtain Shop. The scalloped bottom edge of the Regency Duchess 100 percent cotton valance is trimmed with satiny rope cording. It's 50 inches wide and 17 inches long with a 3-inch curtain rod pocket and 2-inch header. The Audrey Bradford valance has a unique look that combines a floral printed upper and a solid blue bottom layer. The valance measures 64 inches by 17 inches to fit a standard window. It includes a two-inch header and three-inch rod pocket (for use with a 2 ½-inch continental rod). Use multiple valances to accommodate wider windows. 3" rod pocket, 2" header, and softly gathers on a 2 1/2" continental rod. Fits a standard single window. Use multiples to accommodate wider windows. With its full shape and colorful striped design, the Mateo Stripe Duchess insert valance adds significant style to any space. Choose from four rich colors: black, basil, pink or brown. This fully lined Mateo Stripe valance has a three-inch rod pocket and a two-inch header. The bottom edge is scalloped and corded. Measuring 50 by 16 inches, it can be used alone or with the Duchess valance. Dry cleaning is recommended for this 100 percent cotton valance. You can use the Mateo Stripe Duchess Insert Valance to accentuate any window in your home. Made of 100% Cotton, dry cleaning is recommended. This Imperial Dress Gray Duchess insert window valance has a Jacobean floral pattern with yellow, pale green and cream colors on woven jacquard. It's available in 100 percent cotton from The Curtain Shop. 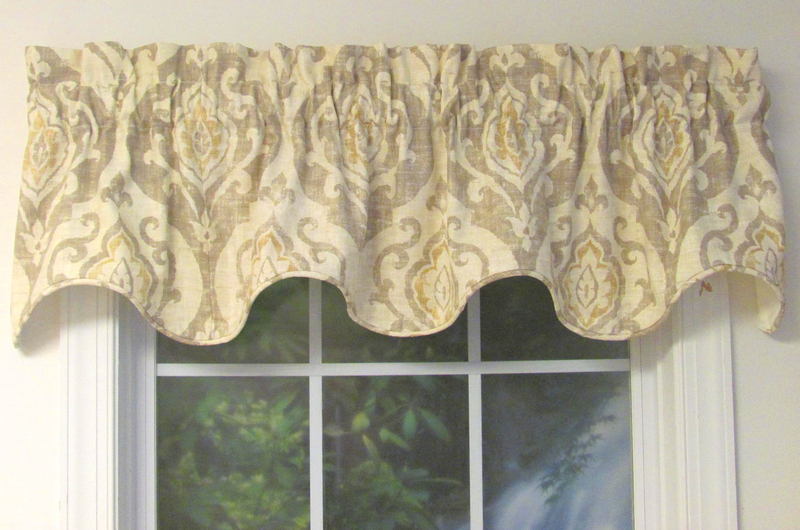 This valance by Ellis Curtains is 50 inches wide to accommodate a standard window width. Or, use it as a filler at the center of a two-piece matching Imperial Dress valance set for larger window sizes. The length is 15 inches on this fully lined scalloped valance trimmed in coordinating rope cording. 3" rod pocket, 2" header, fully lined. Let the warm seasonal breezes waft into your home with the Tree Blossom Natural Cambridge valance. 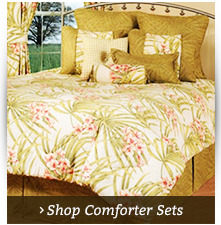 The high-quality fabric features a floral dogwood pattern with touches of green and yellow. The curtain dimensions are 75 inches wide by 18 inches long - perfect for a sunny kitchen or shady living room window. The Tree Blossom Natural Cambridge curtain is also available in a 100-inch width for wider windows - or use multiple 75-inch width valances to create a custom fit for uniquely-shaped windows. Enjoy a soft floral look all year long with this neutral valance that goes well with any style of home furnishing. 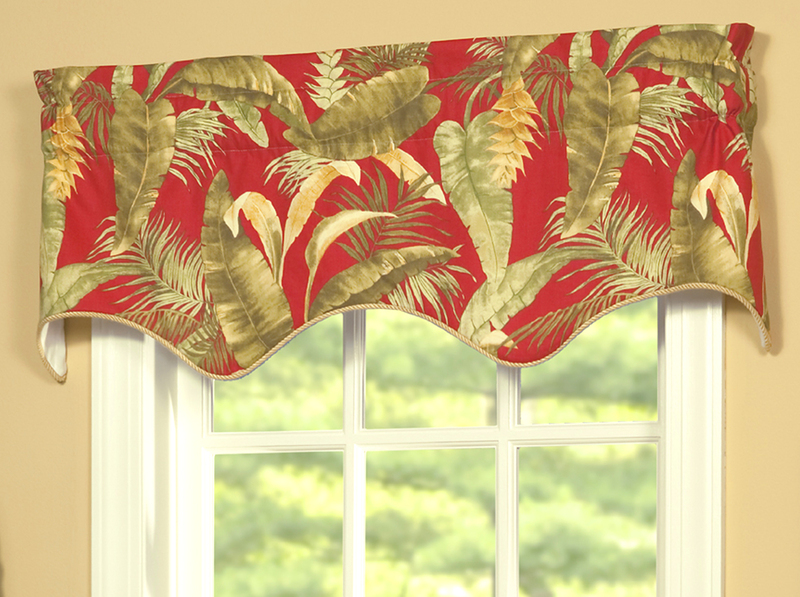 The Captiva Filler Valance, with its a tropical allure, features green tones and gold on a deep red ground. It has a scalloped bottom edge adorned with twisted braid and is fully lined, with a 3 inch rod pocket and two inch header. Allow two times your rod width for proper fullness, or stretch it out to lay flat on your curtain rod. Use multiple to accommodate wider windows. The Filler Valance fits perfectly with the 2 piece Empress Swag. Use a 2 1/2 inch continental rod for hanging. Fabric is Cotton and is made in the USA. 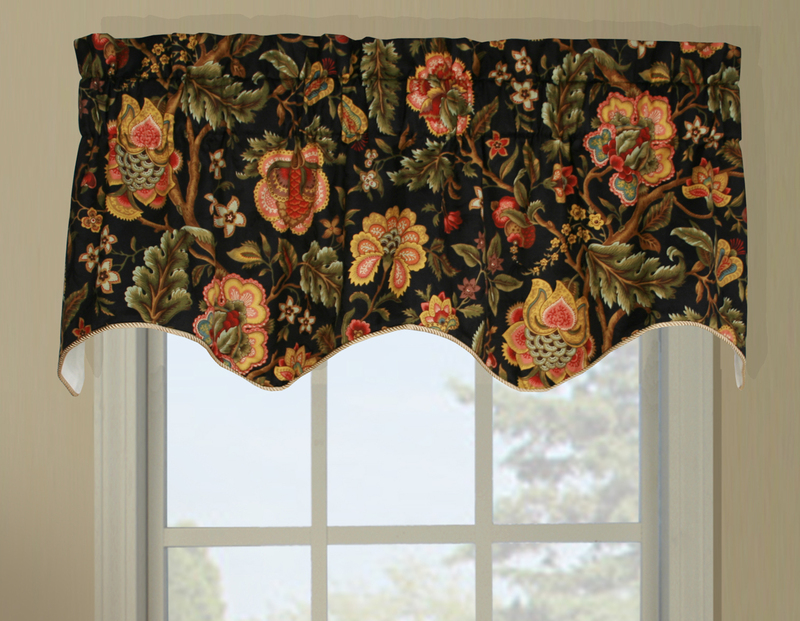 This Imperial Dress insert window valance with a Jacobean floral pattern by Ellis Curtains is available in black, gray or red background finishes from The Curtain Shop. The border is scalloped and trimmed in twisted rope cording. With a width of 50 inches and length of 15 inches, you can use this as a window topper for standard-sized windows or as a filler valance to insert at the center of matching two-piece valances for larger windows. This 3-inch rod pocket valance with 2-inch header is fully lined and made of 100 percent cotton. An off-black shadow pattern of leaves, vines and flowers on a cream background create this Eugene Duchess insert valance by Ellis Curtains now on sale at The Curtain Shop. The fully lined 100 percent cotton window valance is 50 inches wide and 15 inches in length. Order two valances for a standard window, or use this insert valance as a filler at the center of a matching two-piece valance for larger window sizes. The curtain pocket is 3 inches in size. Use two valances to fill a standard single window. 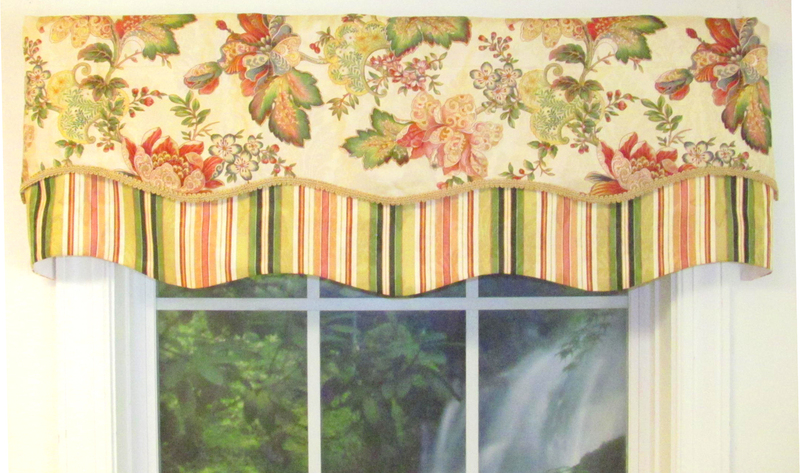 Warm shades of burgundy, green, salmon and gold create the floral pattern and coordinating striped layer on this double-layer Noblesse Ruby window valance by Swavelle Millcreek. The scalloped bottom edge of the top layer is embellished with gold cording. The Ellington Poppy bottom layer is created with coordinating stripes in green, gold and salmon. The fabric is 100 percent sateen cotton on this gorgeous valance now on sale at The Curtain Shop. The width is 50 inches, and the length is 15 inches. The 3-inch rod pocket will accommodate a continental or decorator curtain rod with a diameter of 2 1/2 inches. Wider sizes for larger windows are available by special order. These double-layer Findlay Seaglass valances have a large paisley-style pattern that's also called Camelot Seaglass on the top layer. The bottom layer is a Colburn Capri small check pattern in lovely neutral shades from The Curtain Shop. 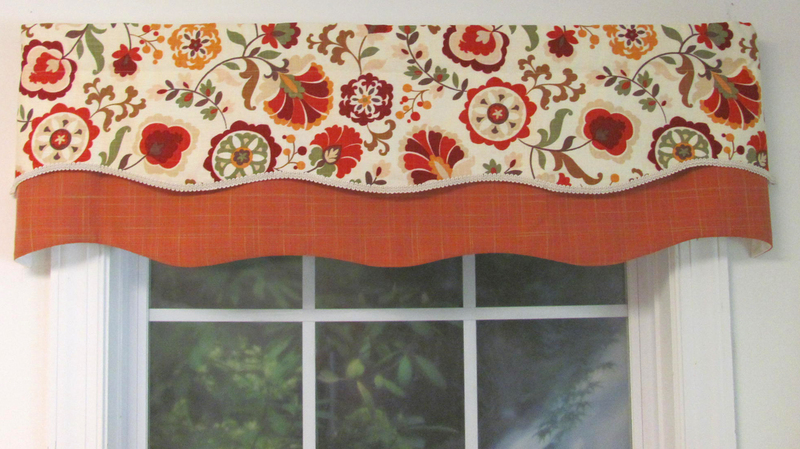 This U.S.-made scalloped valance with coordinating twisted cord trim is 50 inches wide and 15 inches long. The fabric is by Faith Edward from our Almost Custom collection of affordable custom-look curtains and valances. 3" rod pocket, no header, and fully lined. Click on photo to enlarge, you don't want to miss a detail! The Mateo Stripe double scallop valance features rich, dark tones and two fully lined layers. The top layer features gold gimp cording while the bottom layer has a coordinating solid color. This valance includes a three-inch rod pocket to fit a 2 ½-inch continental rod. Made in the U.S. with 100 percent cotton, the valance measures 50 by 15 inches and fits a standard single window. Multiples may be used for larger windows. Dry clean only. 3" rod pocket, no header. 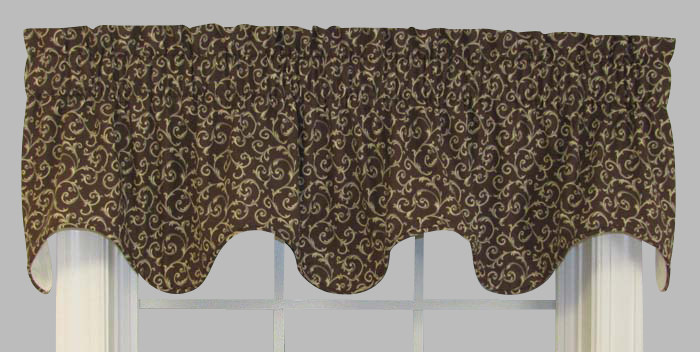 Our beautiful Double Scallop Valance give you a custom look at "off the rack" pricing. Dimensions: 50"W x 15"L. Fits a standard single window up to approximately 46" wide. Use multiples to accomodate wider windows. Fully lined, 3" rod pocket. Use a 2 1/2" Continental rod for hanging. Made of 100% Cotton. Dry Clean. Dimensions: 100"W X 15"L Note, other widths may be special ordered. 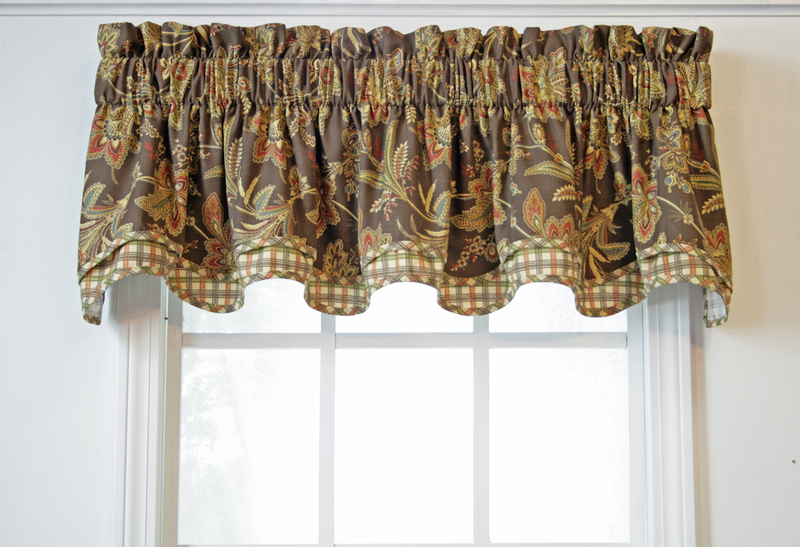 This Double Cambridge window valance will add a soft, elegant look to any room. A pattern of vines and leaves decorates the front layer, and coordinating stripes are the pattern on the second layer. It's 100 inches wide and 15 inches in length. Satiny cording trims the scalloped borders on this U.S.-made window topper. Both layers Of the Cambridge Valance are self corded along the beautiful scalloped bottom edge. Both layers are fully lined in a high quality off white poly/cotton blend lining fabric. Allow between 2 and 2 1/2 times your rod width for proper fullness. This Devon stripes scalloped valance has a striped pattern in basil, gold, muted red and ivory to add a touch of elegance to any room in your home. This affordable look from The Curtain Shop is fully lined in an ivory cotton poly blend with a 100 percent cotton face. A 2-inch heading allows ruffling above, and a 3-inch curtain rod pocket is sewn into the valance. The scalloped border is trimmed with twisted rope cording. 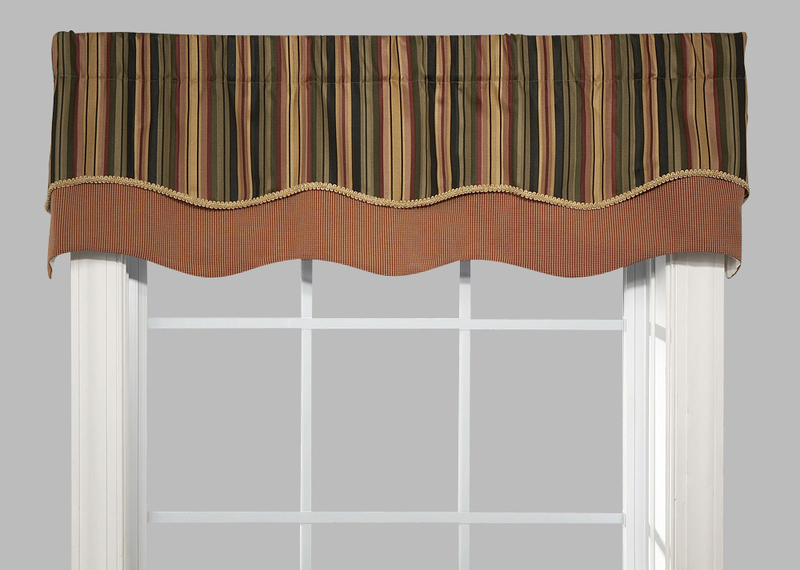 •This valance is trimmed with a twist cording. Our collection of Devon striped window valances in rich stripes of reds, blacks, gold and green are a popular addition to our classic window treatment lines at The Curtain Shop. The 74-inch width allows this scalloped valance to beautifully drape on a standard window size. The facing is 100 percent cotton, and the lining is a sturdy cotton poly blend. A 3-inch curtain rod pocket sits below a 2-inch ruffled header. The scallop-cut border is edged in twisted satiny rope cording. •74"Wide by 16" long. (flat measurement). •Valance is trimmed with a twist cording. Dimensions: 52"W x 14"L x 16"L measured from top of rod pocket. 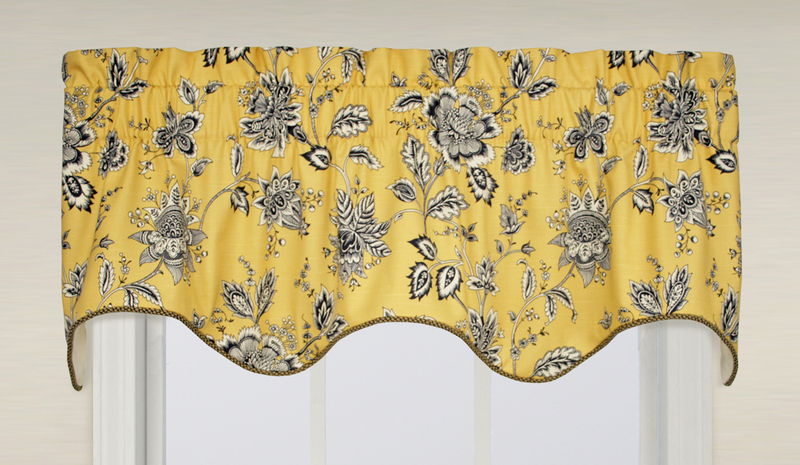 The Bumblebee Glory print is available in wine, black and cream valance styles. Each one features an embroidered gold bumblebee motif and a scalloped bottom edge with matching gold embroidery and gold ball trim. A three-inch rod pocket and bottom layer lining are included in this American-made, 100 percent polyester valance. Each wine, cream or black and gold valance measures 52 inches by 14 inches long (16 inches from top of rod pocket). 3" rod pocket, no header, bottom layer lined. Enjoy a coastal look in any space with the linen Glory valance. Ball trim and a black-colored bottom layer accent the top layer of the fabric, which features a seashell print on an ecru background. Each of these valances features a three-inch rod pocket for easy installation. A full lining is also included. Made in the U.S., the fabric is a cotton/poly blend with a rayon trim. It can be spot cleaned as necessary. Add rich colors to your space with the Glory valance in Odienne Wisteria fabric. The embroidered leaf pattern features gold, mauve, brown and taupe tones on a neutral background. A coordinating striped bottom layer and ball trim are included. Both layers of this stunning Odienne Wisteria valance are fully lined. Made in the U.S. with a cotton/poly blend and rayon trim, the Glory valance measures 50 inches by 15 ½ inches. Spot clean as necessary. Both layers are fully lined. Fabric Content: 30 % Cotton / 70% Polyester. Trim is 100% Rayon. Spot clean. Made in the USA, Odienne in Vintage features embroidered leavery in gold, green and copper tones on a copper ground. Coordinating ball trim adorns the top layer. Bottom layer accents with rich woven textured stripe. Made in the USA. Both layers are fully lined. Dimensions: 50"W x 15 1/2" L Fabric Content: 30 % Cotton / 70% Polyester. Trim is 100% Rayon. Spot clean. This Tyvek scallop window valance by Ellis Curtains is available in a small diamond pattern in rust at The Curtain Shop. It's a fully lined American-made 100 percent cotton valance in a 70-inch width and 15-inch length designed to fit a single standard window. 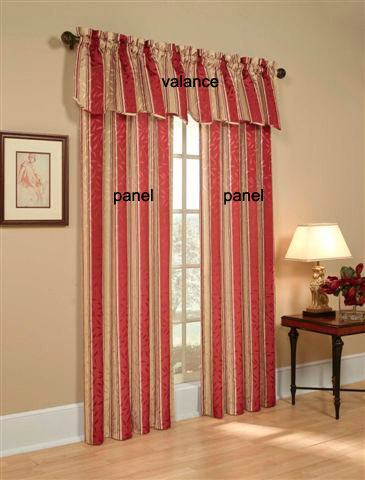 To add more fullness, purchase two valances. The 2-inch header creates subtle ruffling at the top. A 3-inch rod pocket will accommodate a 2 1/2-inch diameter curtain rod. The scalloped bottom edge is self-corded. These beautiful Tremblay scallop window valances in blue or rust by Ellis Curtains are available in a 70-inch width from The Curtain Shop. The length is 15 inches on this fully lined American-made window topper with a self-corded bottom scalloped edge. The fabric is 100 percent cotton. The 2-inch header adds subtle ruffling at the top. To create more fullness on a single standard window, purchase two valances. The 3-inch rod pocket will accommodate a 2 1/2-inch diameter continental curtain rod. 3" rod pocket, 2" header. For a unique look, check out this combination curtain. The Tremblay Bradford valance is accented by a layer of Tyvek fabric on the bottom as well as a scalloped edge. This 70- by 15-inch valance fits a standard single window and is made in the U.S. by Ellis Curtains. It's on soft, 100 percent cotton seven-ounce duck cloth, so dry cleaning is recommended. Two-inch header and three-inch rod pocket included. This Duchess Omaha pattern insert valance in sage by Ellis Curtains can create a beautiful new focal point in your room alone or as an insert to matching Duchess window valances. The scalloped, corded border creates an elegant finish to this beautifully designed fully lined valance with its small onion pattern that easily accents classic and contemporary décor. 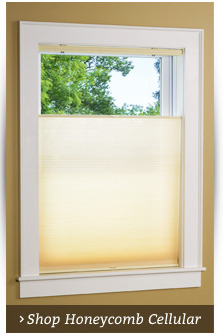 The window topper has a 3-inch curtain rod pocket in a 50-inch width to accommodate standard window sizes. The length is 15 inches. We have been helping homeowners create beautiful living spaces since 1953 with Made-in-America curtain fashions. Dimensions: 50"W x 15"L. 3" rod pocket, 2" header, fully lined. Made in the USA. Featured color is Wedgewood Blue. 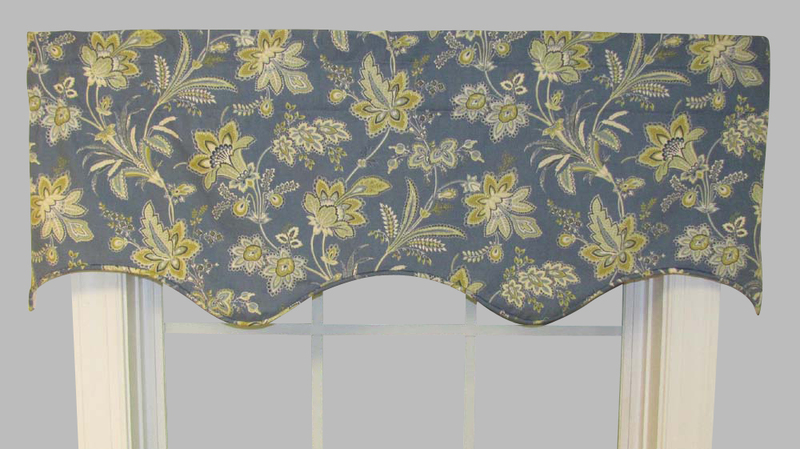 This beautiful Duchess Barona insert valance has a Jacobean floral design with your choice of a Wedgewood blue, navy, brown or green background at The Curtain Shop. It's a custom look in window treatments created by Ellis Curtains in 100 percent cotton in a 50-inch width and 15-inch length. The scalloped border has satiny twisted rope cording. Use it alone as a window topper on a standard window, or combine it with a matching two-piece valance set for larger windows. We recommend the use of a 2 1/2-inch continental rod with the 3-inch curtain rod pocket. 3" rod pocket, 2" header, fully lined. Use a 2 1/2" continental rod for hanging. Fabric Content: 100% Cotton, dry cleaning recommended. Choose the Barano Bradford valance to get four color options (brown, wedgewood blue, navy or green). The 74- by 17-inch valance includes a two-inch header and three-inch rod pocket. The elegant design includes a scalloped bottom edge with a coordinating Charlestown Check layer on the bottom. These 100 percent cotton, dry clean valances are made in the U.S. by Ellis Curtains. This Spring Valley double scallop valance has two layers to create a fresh, lovely look for any room. Beautiful spring flowers create the pattern on the ecru top layer, and stripes in coordinating colors create the second layer. It's available in a 50-inch width from The Curtain Shop that will fit standard window sizes up to 46 inches wide. The length is 15 inches. Use a 2 1/2-inch continental rod with the 3-inch rod pocket for hanging. The construction of this fully lined valance is 100 percent premium cotton. Dimensions: 50"W x 15"L. Fits a standard single window up to approximately 46" wide. Use multiples to accommodate wider windows. Made of 100% Combed Cotton. Dry Clean. A floral design in 100 percent linen fabric will add elegance to any room with these Denehy Duchess insert window valances by Ellis Curtains. This scalloped valance with twisted rope cording trim is available in soft blue or neutral linen from The Curtain Shop. It's a stand-alone valance for standard window sizes with its 50-inch width. 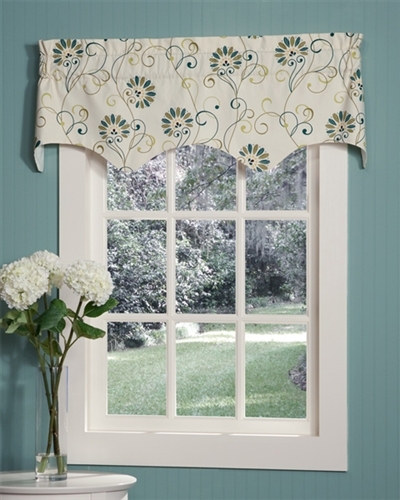 Or, use it at the center of a two-piece Duchess Denehy valance set for a larger window. 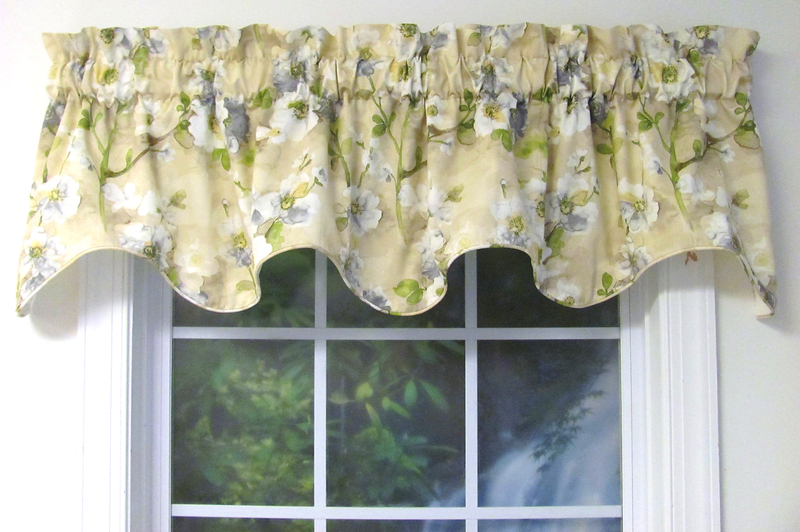 The length on this fully lined American-made insert valance with a 3-inch curtain rod pocket is 15 inches. 3" rod pocket, 2" header, fully lined. Use a 2.5" continental rod for hanging. Made of 100% Linen by Ellis Curtains. Dry Clean Only. Dry Clean Only. A beautiful floral design over a sophisticated striped pattern defines this Winnie Parchment double valance from The Curtain Shop. Wine and gold tones on a cream jacquard background create the top layer. The bottom layer is Teresa stripes in coordinating shades of rust, gold, pale green and cream. The width is 50 inches, and the length is 15 inches on a double scallop valance in 100 percent combed cotton. It will fit standard window sizes up to 46 inches in width. Order two for wider windows. The scalloped border is trimmed with twisted rope cording in a gold color on the top layer. Fits a standard single window up to approximately 46" wide. Use multiples to accommodate wider windows. The Charlestown Check Bradford valance comes in four color options: seafoam, watermelon, patriot and brown. The small check pattern fabric is made in the U.S. by Ellis Curtains with 100 percent cotton seven-ounce duck cloth. A three-inch rod pocket and two-inch header are included. Measuring 70 inches wide by 15 inches long, this valance should be dry cleaned. 3" rod pocket, 2" header, not lined. 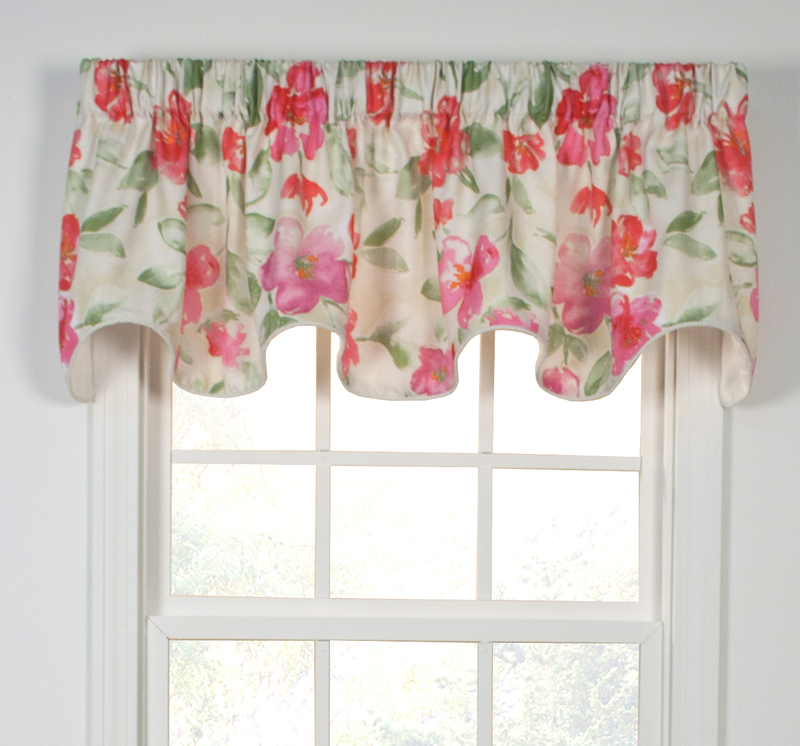 These fully lined two-piece Charlestown Check window valances by Ellis Curtains are available in a cheerful watermelon or bold patriot pattern from The Curtain Shop. The scalloped bottom edge is self-corded. 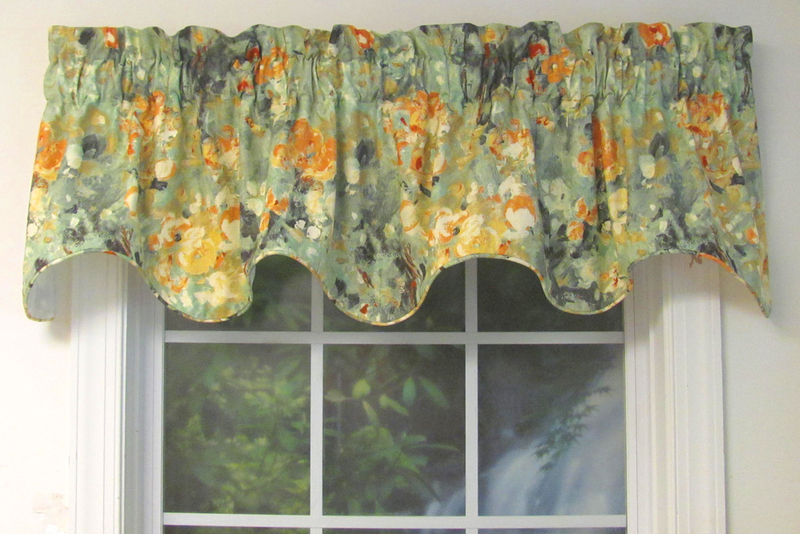 This 100 percent cotton American-made valance is 70 inches wide and 15 inches long. This size will fit a standard single window. Use with a matching valance insert for wider windows. 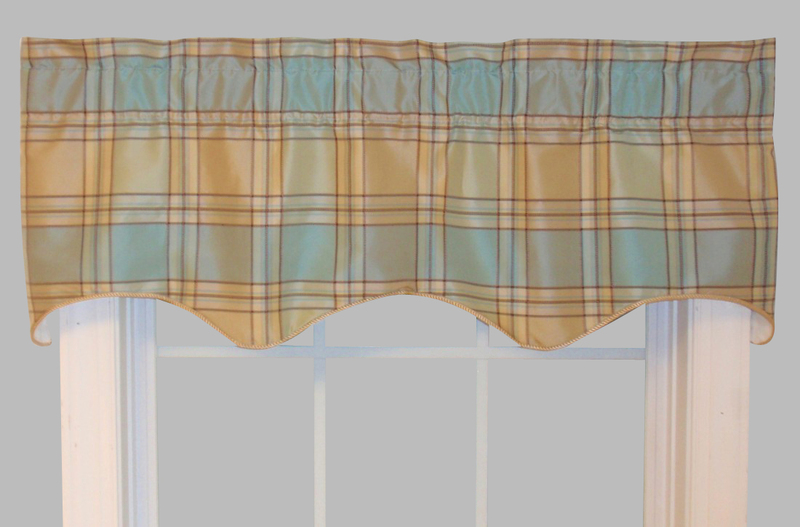 This Duchess Boroughs Plaid insert window valance by Ellis Curtains is available in blue or plum plaid from The Curtain Shop. 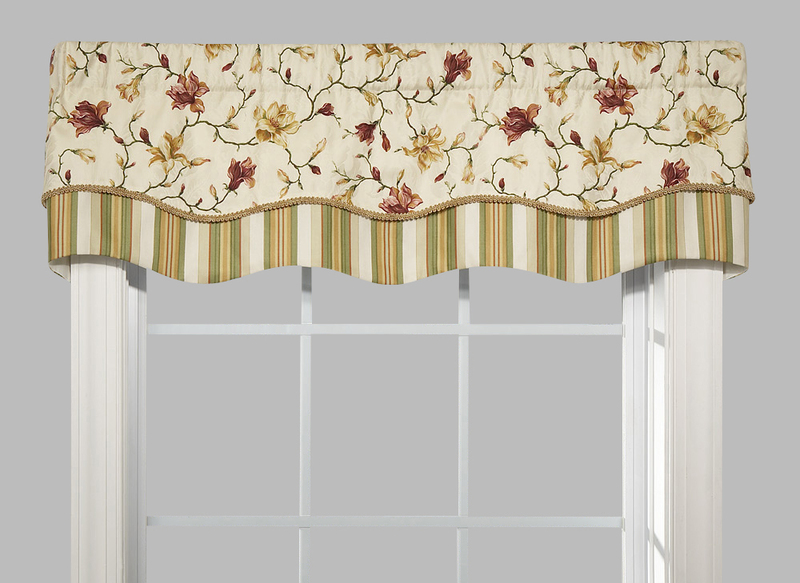 The width is 52 inches on this fully lined valance to accommodate a standard single window size. You can also use this as a filler valance with matching curtains sets by Ellis Curtains for larger windows. The length is 16 inches. The scalloped border is edged in coordinating rope trim. Fully lined in high quality ivory broadcloth, 3" rod pocket, 2 1/2" header. The large floral pattern on woven jacquard by Waverly creates a rich look on this Duchess Garden Images insert window valance in 100 percent cotton from The Curtain Shop. Orders your scalloped valance with a backdrop of black or sage to add an elegant new focal point to your favorite room. 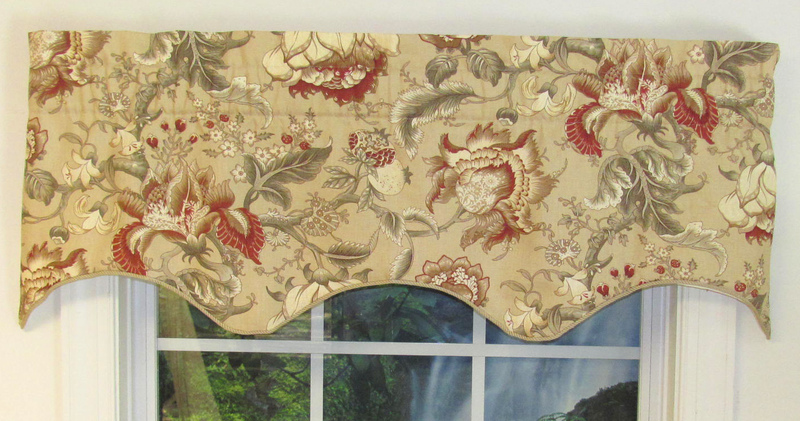 This insert valance is 50 inches wide and 15 inches long. Although designed as an insert with matching Duchess two-piece valances to accommodate larger windows, you can use it as a standard-sized window topper, too. The bottom edge is scalloped and corded, and a 2-inch header creates a ruffle above the curtain rod. Dimensions: 50”wide x 15" long. A Waverly Fabric, Garden Images is a gorgeous large scale floral pattern on woven jacquard ground. This popular fabric design is offered in tow colors: black and sage. The Duchess Insert Valance is a one piece fully lined valance with 3 inch rod pocket and 2 inch header (ruffle above rod). The bottom edge is scalloped and corded and can be used with the Duchess Valance to accommodate larger windows or stands alone on its own. This American-made Nantucket Navy Plaid valance in the Bradford style measures 70 inches wide by 17 inches long. Made by the U.S. with 100 percent cotton, it is dry clean only. The design features a small woven plaid pattern in navy and red. A coordinating scalloped bottom layer is included. The valance features a three-inch rod pocket and a two-inch header. Looks fabulous standing alone on its own, or use with the Duchess Valance to accommodate wider windows. Made in the USA by Ellis Curtains. Fully lined. 3" rod pocket. Bottom edge is scalloped and finished with rope cording. This charming layered Bradford window valance in a Suzanne Stripe pattern by Ellis Curtains intersperses vertical stripes with rows of small flowers on the top layer. The fabric is a cotton duck blend that's machine washable. 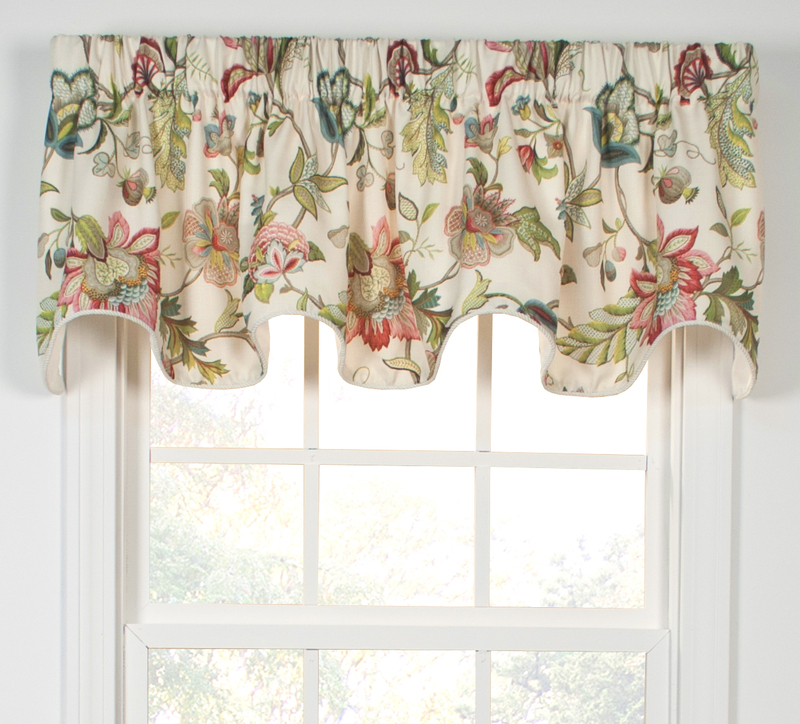 The bottom layer is a coordinating solid color that creates a scalloped border on this American-made window valance. Order yours in blue or an earthy red brick shade from The Curtain Shop. The 70-inch width fits a standard single window. If your windows are wider, order two. The length is 17 inches on these window toppers with 2-inch headers and 3-inch curtain rod pockets. 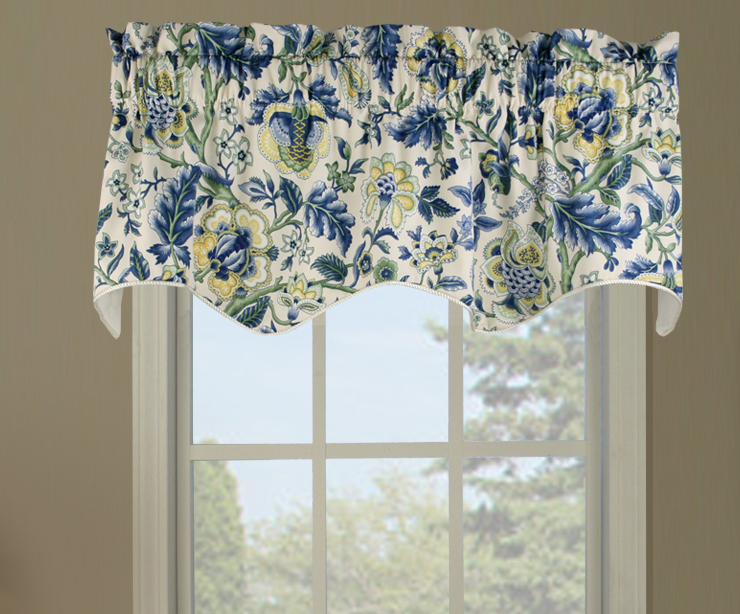 The Victoria Park Bradford toile valance comes in blue, black or red, with each option including a coordinating bottom layer of Logan Check fabric. This is a 100 percent seven-ounce cotton duck valance (dry clean recommended). 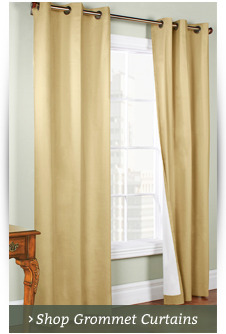 It's made in the U.S. by Ellis Curtains and features a scalloped bottom edge. Measuring 70 inches by 15 inches, it includes a two-inch header and three-inch rod pocket. Photo shows Bradford Valance in Blue. 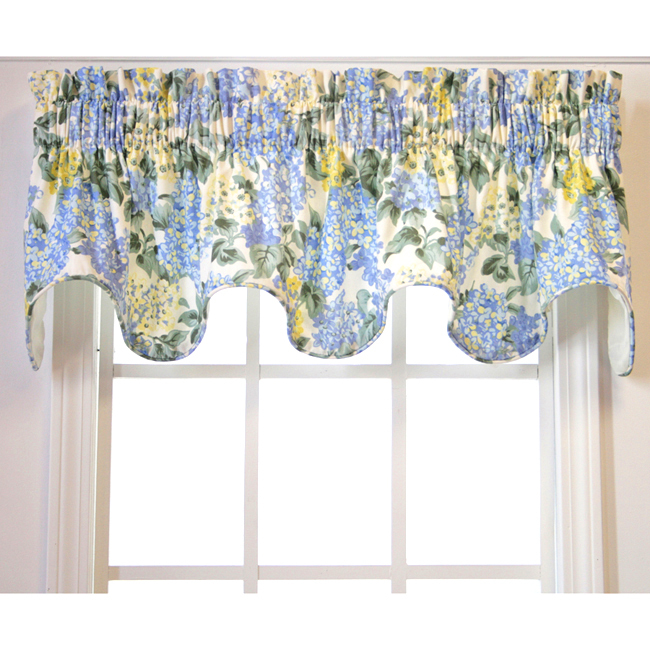 The Emma's Garden insert valance features a traditional floral print with lovely tones of blue, mauve and green on an ivory background. A three-inch rod pocket and two-inch header are included with this fully lined valance. Made in the U.S., this product measures 50 inches wide by 15 inches long. It can be combined with the Duchess valance in a matching print to accommodate wider windows or stand alone on its own. 3" rod pocket, 3" header, fully lined. Use 2.5" continental rod or decorative rod for hanging. The elegant Eckford Paisley insert valance features a three-inch rod pocket and a three-inch header for use with a 2 ½-inch continental rod or 1 3/8-inch decorative rod. 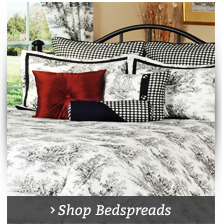 It is fully lined and is made with 100 percent cotton in the U.S. by Ellis Curtains. This paisley valance with rich, warm colors measures 50 by 15 inches and can be combined with the Duchess valance for wider windows. Dry clean only. Measured from top stitch of rod pocket. 3" rod pocket, 2" header, fully lined. Use 2.5" continental rod or 1 3/8" decorative rod for hanging. Made of 100% Cotton by Ellis Curtains. Dry cleaning recommended. A lovely floral design in soft reds, greens and gold on ivory creates the pattern on this best-selling Whitfield scalloped window valance from The Curtain Shop. It's an elegant choice in a 52-inch width and 18-inch length with a 1 1/2-inch curtain rod pocket. The header is 1 1/2 inches. 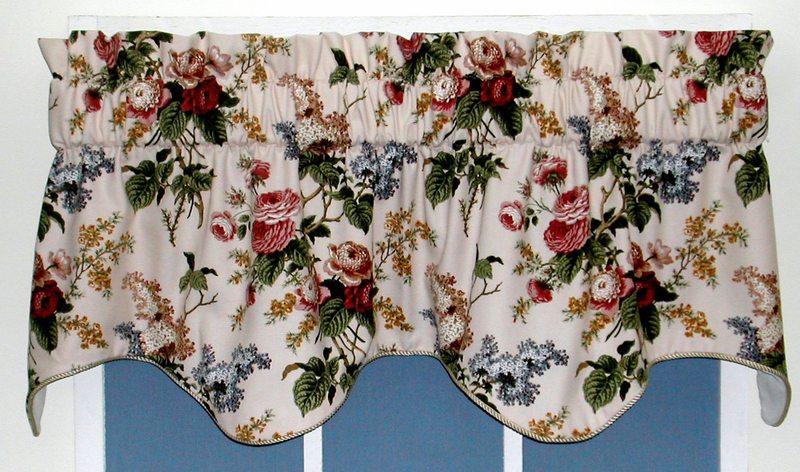 This easy-care Whitfield floral valance is machine washable, too. We've been selling beautiful valances and drapes since 1953. Trust our expertise, and enjoy our superior customer service. This Duchess window insert valance with Calloway stripes by Ellis Curtains is available in cinnamon, brown or blue at The Curtain Shop. The 1 1/2-inch stripes are in beautiful earth tones for a rich look to this window topper in a 50-inch width and 15-inch length. Use it as a standard-size window topper, or pair it with matching valances for larger windows. This scalloped valance with twisted rope cording trim has a 3-inch rod pocket and 2-inch ruffle header. It's fully lined and machine washable. 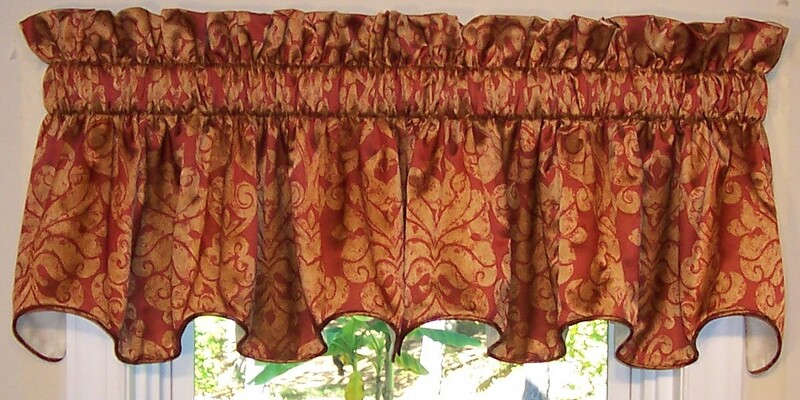 Photo shows two Duchess Insert Valances in Cinnamon on a 41" wide rod. Features 1 1/2" wide stripes. Using multiple Insert Valances to accommodate any window width, or using this window topper with the Duchess Valance window swag to fit any window size are both wonderful window valance ideas. Measured from top stitch of rod pocket. 3" rod pocket, 2" header, fully lined. The scalloped bottom edge is embellished with coordinating twisted rope cording. Use 2.5" continental rod or 1 3/8" decorative rod for hanging. Machine wash cold water on gentle cycle, tumble dry low heat, warm iron touch up. Photo shows Duchess Insert window topper in Cinnamon. 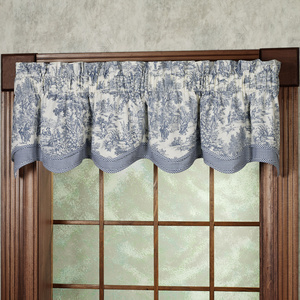 ,br> Add additional insert valances with the Duchess Valance to accommodate wider windows, or stands alone on its own. Use two insert valances for a standard single window. This Melbourne swag insert window valance from The Curtain Shop is elegantly crafted of 100 percent cotton with a classic woven floral design in warm colors on an ecru or burgundy background. It's fully lined with a corded bottom edge, 3-inch curtain rod pocket and 2-inch header. The width is 50 inches. Use as a single valance on a standard single window. Or, use it as a center insert valance to add more width or fullness to a matching Melbourne three-piece swag set. Logan Check Bradford is a double scalloped valance made with a 3 inch rod pocket, 2 inch header, and is beautifully accented with Logan Solid fabric for a bottom layer. Not lined, not available in black. The Riviera look is a large leaf and vine pattern in cinnamon, coffee, black or brown against an ivory background on this Duchess insert window valance by Ellis Curtains. Order yours from The Curtain Shop to use alone on a standard window or with matching Duchess Riviera valances for larger window sizes. The scalloped border has contrasting trim on this cotton poly window topper that's machine washable. It's 50 inches wide and 15 inches long. 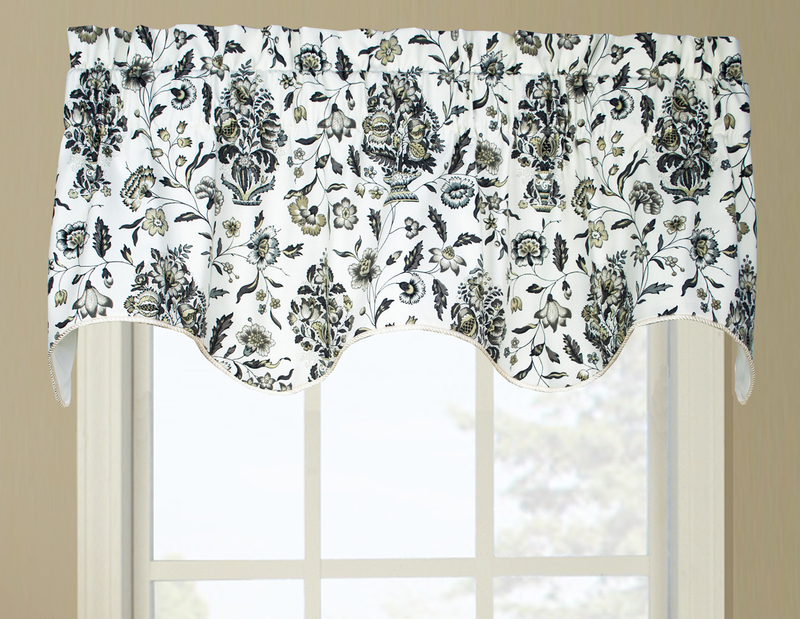 Add more fullness by ordering two Duchess Riviera insert valances. Made of 66% Polyester and 34% Cotton. Machine washable in cold water on gentle cycle. Air dry. Iron as needed. 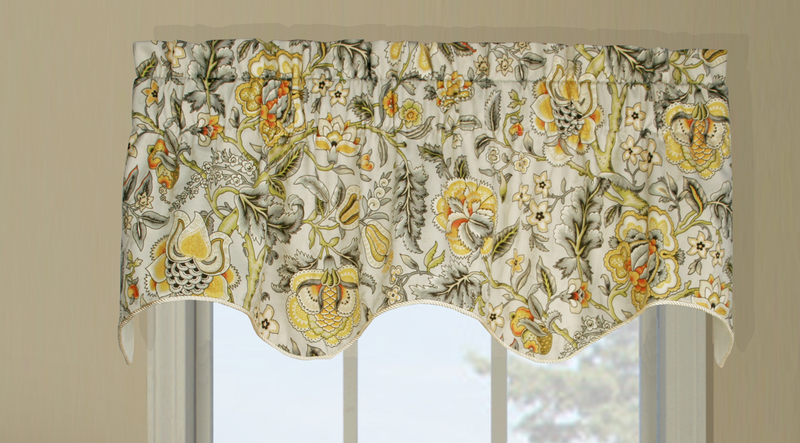 A Jacobean floral print on this Duchess Jeanette insert valance by Ellis Curtains is available in yellow or red from The Curtain Shop. The yellow is accented with black, and the red is accented with chocolate to create elegant window valances that can top a window alone or be used as an insert valance for larger windows. This 100 percent cotton rod pocket window topper is 50 inches wide and 15 inches long. 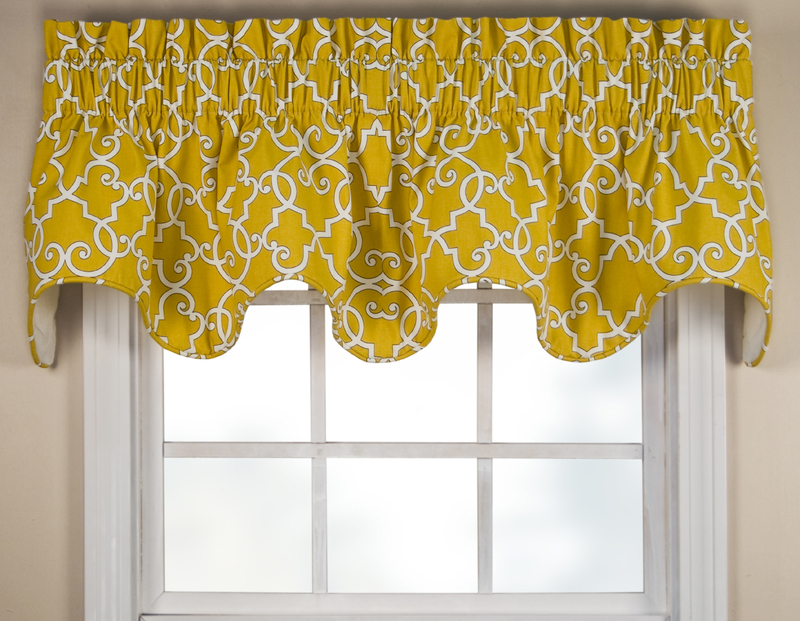 It's fully lined with a 2-inch header to create a ruffled effect above the curtain rod. 100% Cotton. Dry clean to avoid shrinkage. Use additional insert valances to accommodate wider windows, or stands alone or on its own. Use two insert valances for a standard single window. The Amherst Duchess Insert Valance measures 50" wide by 16" deep. Like the Duchess Valance, it has a 3" rod pocket and 2" header. The bottom edge is scalloped and finished with rope cording. Use it with the Duchess Valance to enlarge for accommodating wider windows. Also stands alone on its own. Photograph illustrates one 50" Duchess Insert Valance. Try using two Duchess Insert Valances for a nice full look (at approximately 2:1 ratio). The Francesca Lilac Bradford valance has a beautiful floral pattern accented by a coordinating lavender bottom layer. 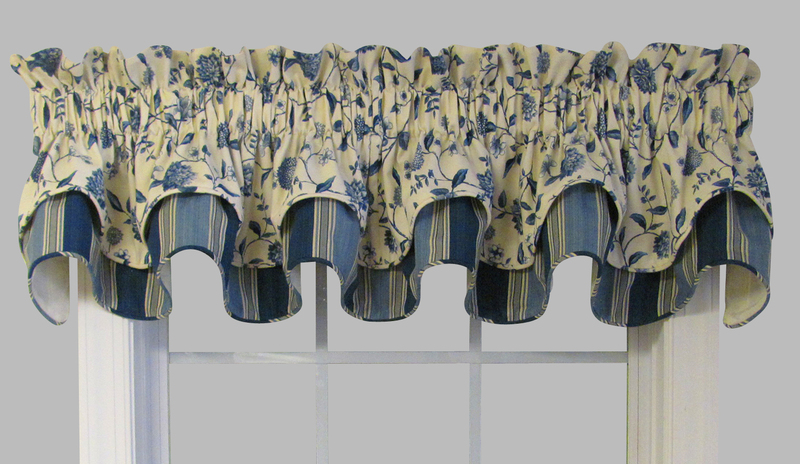 This lined, double-layered, scalloped valance is made in the U.S. by Ellis Curtains. The fabric is 50 percent cotton, 50 percent polyester. A three-inch rod pocket and two-inch header are included. Machine wash cold. Fabric content is 50% Polyester/50% Cotton Duck. This Whitfield scallop valance is a woven blend of low-gloss and shiny yarns that create a richly textured jacquard fabric with an elegant leaf design. The scalloped bottom edge has self-corded trim. 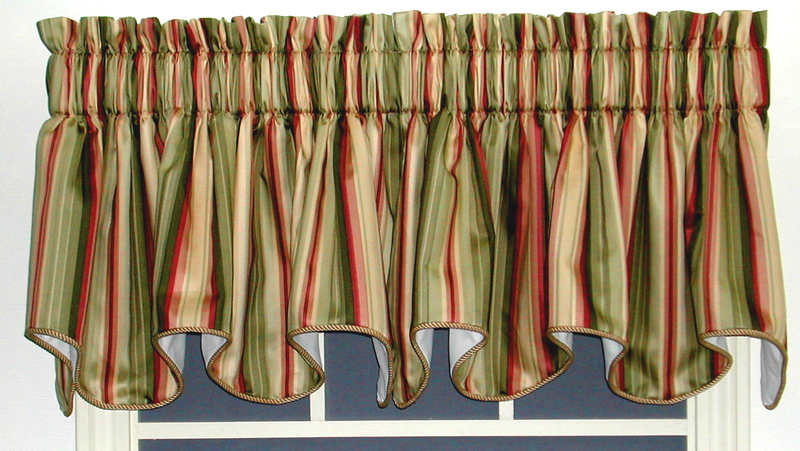 This fabulous tone on tone window valance is available in eight colors from The Curtain Shop. Choose white, ivory, chocolate, blue, latte, sage, wine or navy. The width is 52 inches, and the length is 18 inches on this machine washable window topper. This tone-on-tone jacquard Whitfield stripes scalloped window valance has an all-over leaf motif with coordinating stripes in your choice of blue, wine, spice, chocolate or buttercream. It's available in a 52-inch width and 18-inch length from The Curtain Shop. This size will fit a single standard window. For larger windows, or if you want to create a fuller look, order two of these handsomely designed valances. 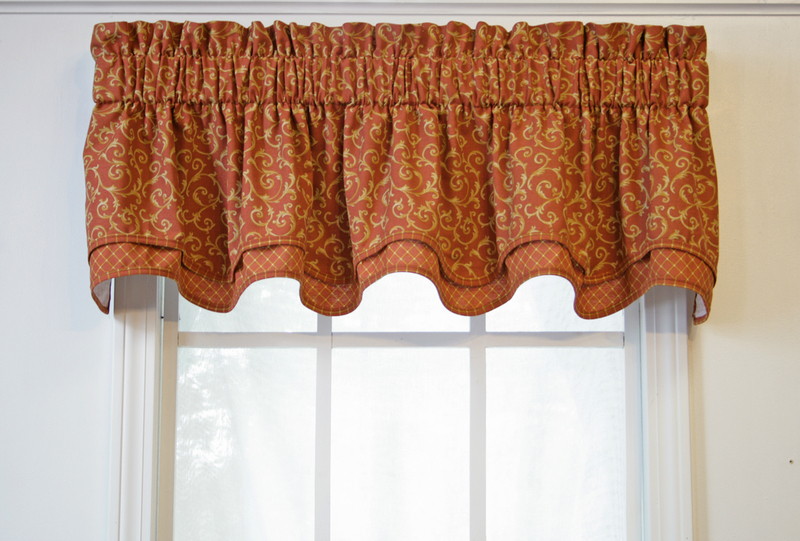 This unlined valance has a 1 1/2-inch header and 3-inch curtain rod pocket. We also carry matching tailored curtain panels. The La Selva Duchess insert valance by Ellis Curtains is a tropical design available from The Curtain Shop with shades of green, red and gold against a black or vanilla background. These 100 percent cotton fully lined window valances are 50 inches wide and 16 inches long to use alone or with matching Duchess valances for larger windows. Use a 2 1/2-inch continental rod with the 3-inch curtain rod pocket for hanging. The scalloped, corded border adds a beautiful finish. For more fullness, simply order one more valance for a lusher look. Dimensions: 50" wide x 16" long (for a gathered look use multiples with a 2 to 1 ratio of fullness). Fully lined, 3" rod pocket, 2" header. Use a 2 1/2" continental rod for hanging. 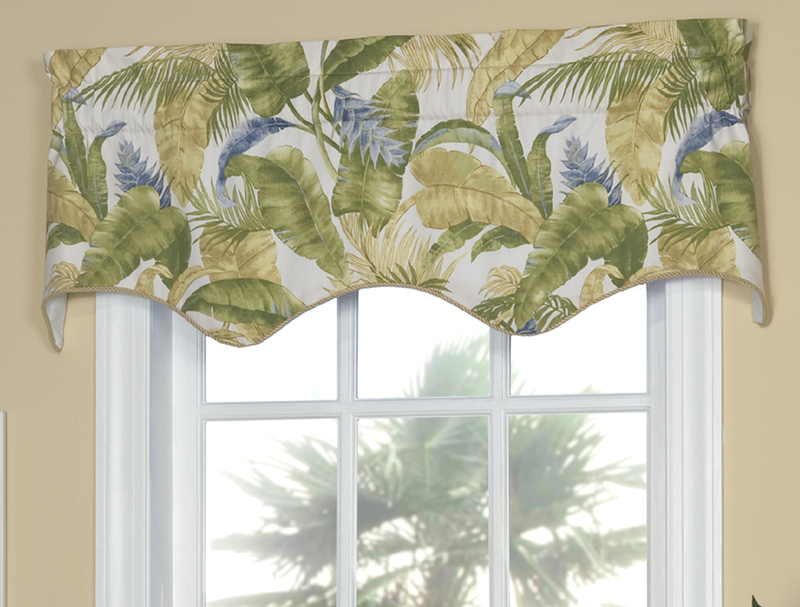 Bottom edge of this beautiful tropical window valance is scalloped and corded with coordinating twisted rope cording. 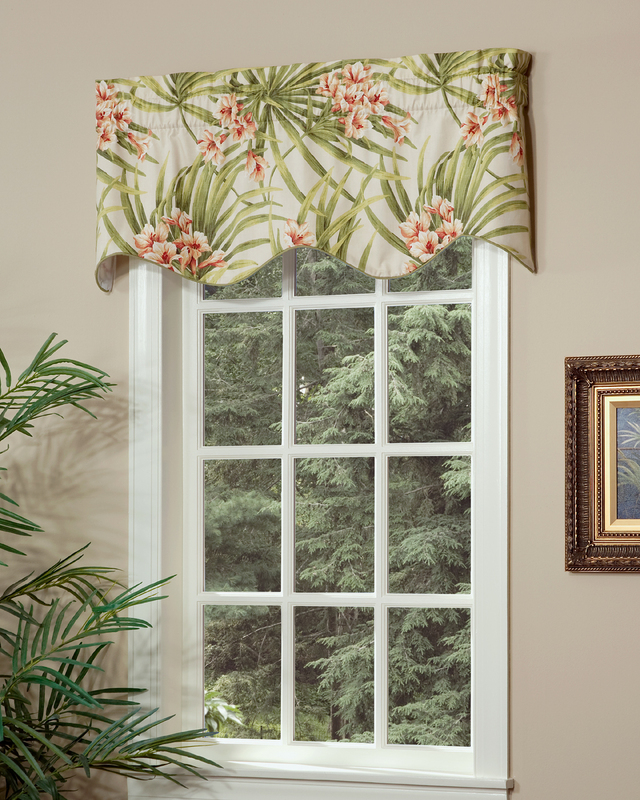 Adding Insert Valances to the La Selva Duchess Valance to accommodate wider windows, or using the Duchess Insert Valance as a stand alone window topper are wonderful window valance ideas. Fabric Content: 100% Cotton, dry clean recommended. Brassic is a stunning and colorful Jacobean Design and is made of machine washiable 100% Polyester Pebble Beach base cloth. 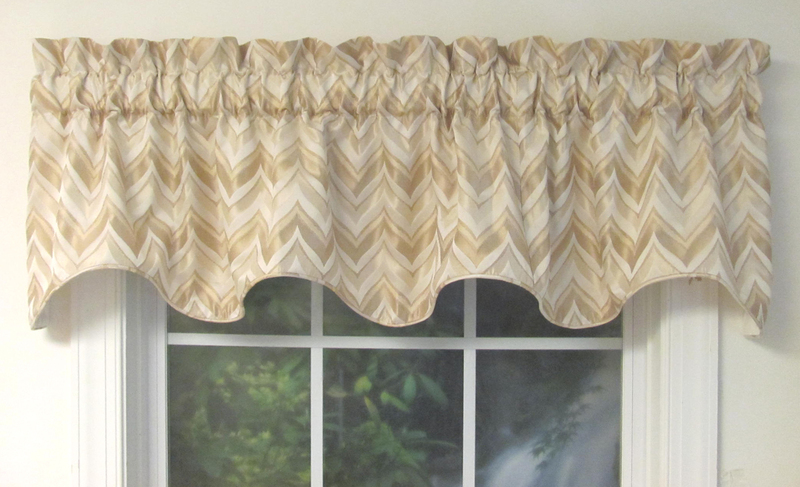 The Scalloped Valance features a three inch rod pocket and no header. It is fully lined in high quality white lining material and measures 70 inches wide and 17 inches long from top of rod pocket. Use multiples to accommodate wider windows, allowing a 2 to 1 ratio of fullness. Imported. Valance has a scalloped bottom, and is lined, has 3 inch rod pocket with 2 inch header. Use a 2 1/2" continental rod for hanging. Measurements are 70 inches wide by 17 inches long and fully lined in white with a three inch rod pocket and no header. This lovely water color floral design features a pretty pink floral design and matching grommet panels (sold separately) will set the mood for any room in your home. This brightly colored scalloped valance looks great in any room where you desire a soft romantic and at home touch. Made of 100% Pebble Beach Base Cloth and machine washable! This now high fashion geo print is offered in four awesome colors; Black, Marine, Sunflower, and Tomato. The Wolburn Scallop Valance measures 70" wide by 16" long and is fully lined in white lining material. Three inch rod pocket fits a 2 1/2" continental rod for hanging. Header is two inches. Constructed of 52% Polyester, 48% Cotton 5 ounce cotton duck. Machine washable! Made in the USA, Floating Leaves fully lined Scalloped Valance measures 70 inches wide by 15 inches long, and matches up with center of Empress 2 piece Swag. 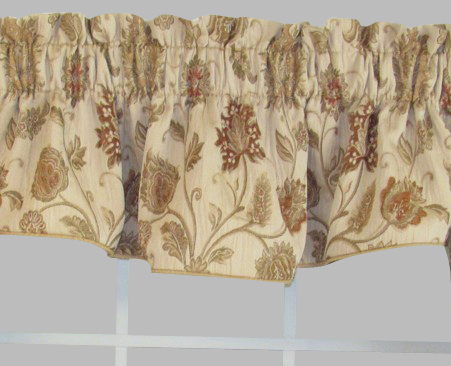 This fully lined valance comes in four popular colors, each embellished with Beige etchings of floating leaves and is made of made of 52% Polyester, 48% Cotton, and is machine washable. Features include three inch rod pocket and two inch header. Allow at least a 2 to 1 ratio of fullness for proper appearance. Match with with a pair of tier curtains and tailored curtain panels. Toss pillows and shower curtain is also available. 1 1/2" rod Pocket and fully lined. Fits a single window up to 33" wide. 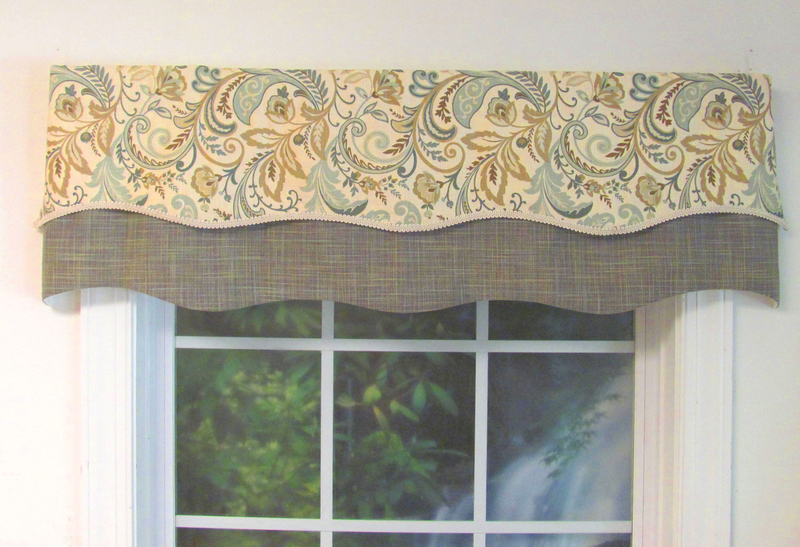 This attractive Triple Scoop Valance features Nassau Vine Porcelain as the main fabric accented with Riveria Strie Blue, a wonderful soft textured stripe, and three covered buttons. Made in America, pretty little rose colored flowers are featured on a tan ground enhanced with a bottom layer in Hunter Green. This lovely unlined double scallop valance is a real bang for the buck, and made in one of our Almost Custom North Carolina work rooms! Dimensions are 72 inches wide by 18 inches long, not including the 3 inch header. Rod pocket is 3 inches. Use a 1 1/2 inch continental rod for hanging. Allow approximately a two to one ratio of fullness. Photo is taken on a 41 inch wide window. Dry clean. Cayman, with its tropical allure, features subtle tones of green and blue on an ivory background. 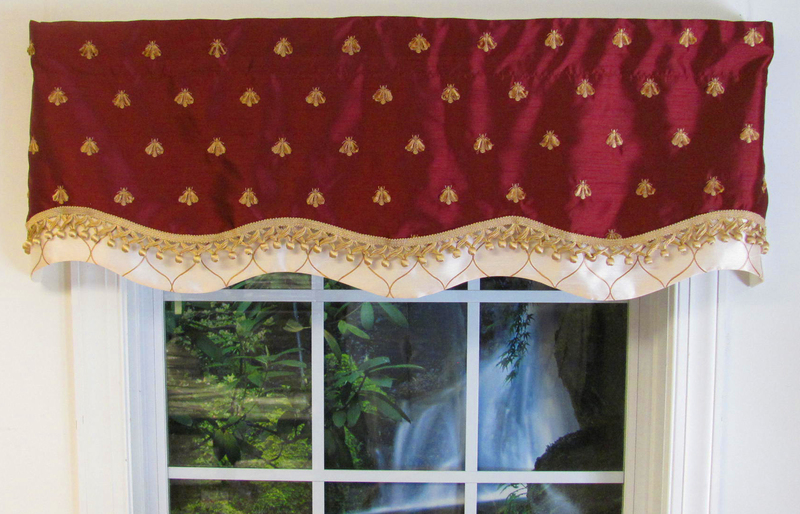 The Empress Filler Valance measures 50" wide and 16" long. It has a scalloped bottom edge adorned with twisted braid and is fully lined, with a 3" rod pocket and 2" header. Allow two times your rod width for proper fullness, or stretch it out to lie flat on your curtain rod. Use multiple valances to accommodate wider windows. The Filler Valance fits perfectly with the two-piece Empress Swag. Use a 2 1/2" continental rod for hanging. 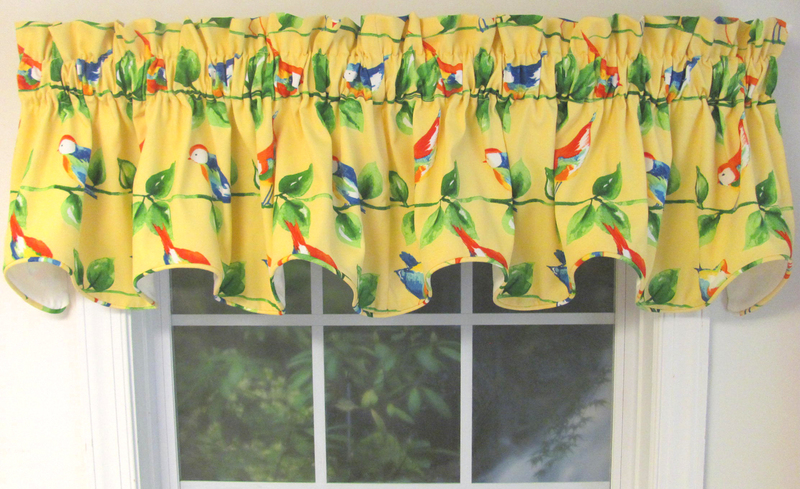 Fabric is cotton and is made in the U.S.
You'll be soothed by the gentle swaying effect of this perfectly proportioned valance and its tropically themed motif. Long blue, tan and green fronds cascade effortlessly over the fabric, and the scalloped bottom edge amplifies the lilting feeling of an afternoon spent in a hammock. The muted tones of Cayman by Thomasville are sophisticated, conjuring up afternoon siestas with a book, not beach parties. Add them to windows in a master or guest bedroom, complement a nature-inspired kitchen or bring the lush plant life on the fabric inside to your sunroom. Cayman by Thomasville even creates a lush ambiance for your bathroom. The Suzette Filler Valance has a scalloped bottom edge adorned with self cording and is fully lined, with a 3 inch rod pocket and two inch header. Allow two times your rod width for proper fullness, or stretch it out to lay flat on your curtain rod. Use multiple to accommodate wider windows. The Filler Valance fits perfectly with the 2 piece Empress Swag. Use a 2 1/2 inch continental rod for hanging. Fabric is Cotton and is made in the USA. The Gigi Filler Valance, in tones of Green and Orange, measures 52" wide by 17" long has a scalloped bottom edge and is fully lined. It has a 3 inch rod pocket and two inch header. Allow at least two time your rod width for proper fullness. Use multiples to accommodate wider windows. 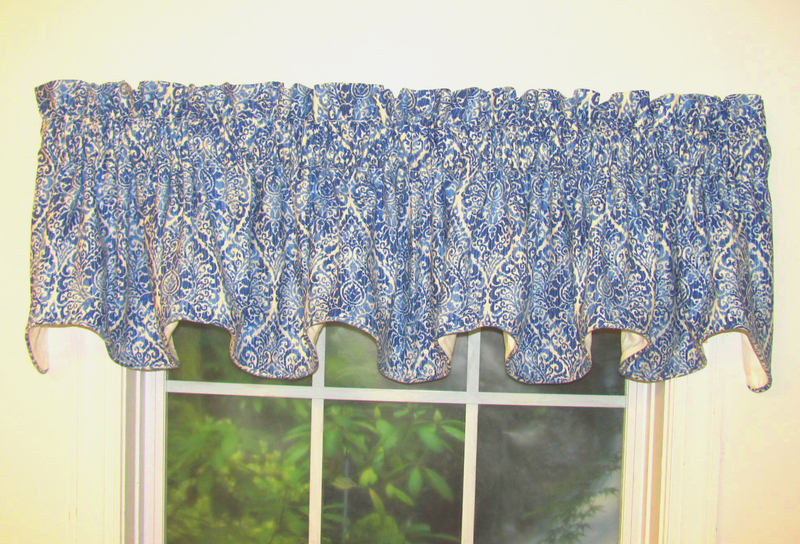 The Gigi Filler Valance also looks fantastic when paired the the two piece Swag. U.S. made of Cotton Duck. Featuring classic self corded scallops, the Cambridge Valance is versatile enough to suit any contemporary or traditional décor scheme. Available in six convenient widths (75-inch, 100-inch, 150-inch, 200-inch, 250-inch and 300-inch) in our Olde Towne Almost Custom Section to accommodate any window. It features a 3-inch rod pocket, 2-inch header and a scalloped bottom edge embellished with self-cording for the ultimate in sensible style. All widths are 18 inches long from top stitch and fully lined in high quality white lining material. Use a 2-1/2 inch continental rod for hanging. Made in the USA. Featuring classic self corded scallops along bottom edge in beautiful neutral tones, our Suri Raffia Corded Scalloped Valance is versatile enough to suit any contemporary or traditional décor scheme. Wider sizes are available In our Almost Custom-Custom Select program, or use multiples to accommodate wider windows. It features a 3-inch rod pocket, 2-inch header and a scalloped bottom edge embellished with self-cording for the ultimate in sensible style. All widths are 15 inches long from top stitch of rod pocket. The Findlay Seaglass Double Scallop Valance features a bottom layer in Casual Texture Pewter. Gimp cording is included along the bottom edge the top layer. Both layers are fully lined with high quality Ivory lining material. The valance also includes a three-inch rod pocket for a 2 ½-inch continental rod and can be ordered in other widths in our Almost Custom-Custom Select program. 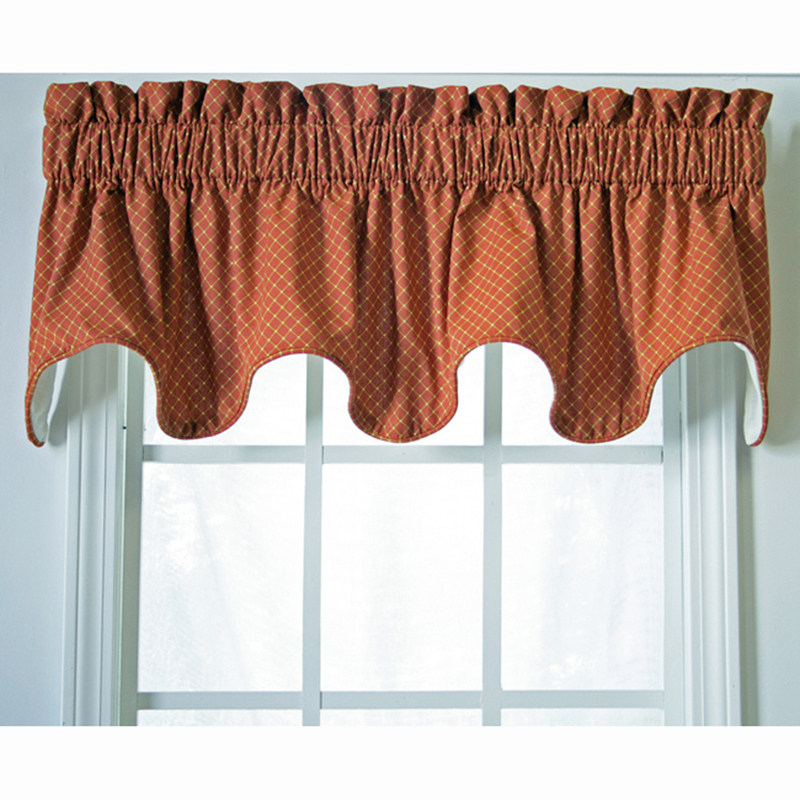 The Daphne Crimson Double Scallop Valance features a bottom layer in Casual Texture Pumpkin. Gimp cording is included along the bottom edge the top layer. Both layers are fully lined with high quality Ivory lining material. The valance also includes a three-inch rod pocket for a 2 ½-inch continental rod and can be ordered in other widths in our Almost Custom - Custom Select program. A beautiful floral design over a sophisticated striped pattern defines this Luxuriance Multi Double Scallop Valance from The Curtain Shop. Wine and green and gold tones on a cream jacquard background create the top layer. The bottom layer is an awesome coordinating stripe shades of winet, gold, pale green and cream. The width is 50 inches, and the length is 15 inches on a double scallop valance in 100 percent combed cotton. It will fit standard window sizes up to 46 inches in width. Order two for wider windows. The scalloped border is trimmed with twisted rope cording in a gold color on the top layer. Fits a standard single window up to approximately 46" wide. Use multiples to accommodate wider windows. Fully lined, 3" rod pocket. Use a 2 1/2" Continental rod for hanging. Made of 100% Combed Cotton. Dry Clean. 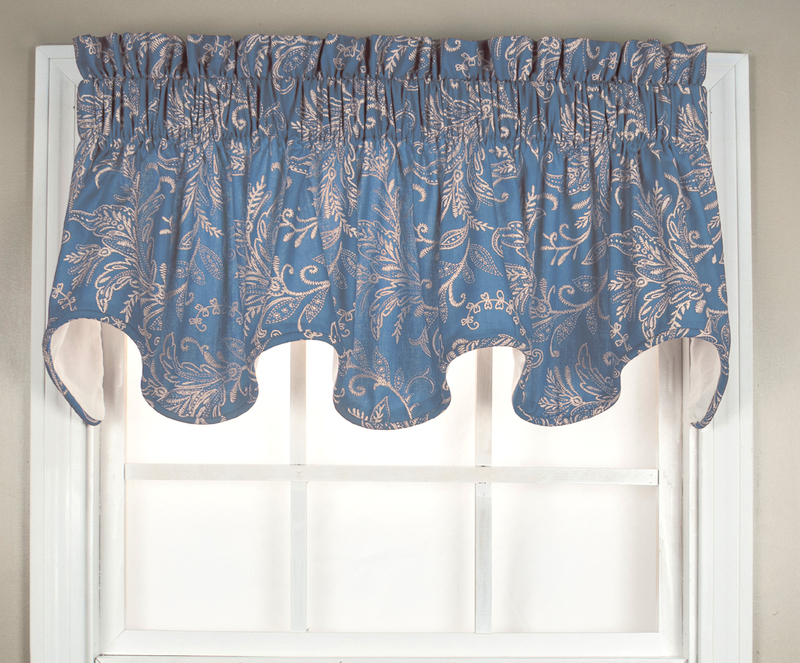 Keep things classy with scalloped valances from The Curtain Shop. This type of valance is an all-time classic and features a sweet scalloped shape that adds intrigue and dimension to your windows. The best part is, a scalloped valance won't compromise your view. These stylish window treatments are well-suited for your kitchen, bathroom, office or any other room where you want to provide a bit of decorative treatment but don't want to cover the window or its view. The Curtain Shop carries the best selection of scalloped valances, including unlined, double valances, filler valances, insert valances and other options by top curtain designers. You'll find a style to suit your specific preferences in our shop, from a soft and inviting scalloped lilac valance for the nursery to a contemporary striped style for your library or home office. The Curtain Shop always offers excellent prices, quick shipping and one-on-one customer service.